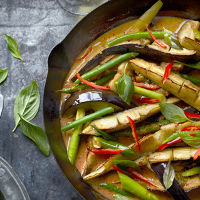 Our twist on a rich red curry. Soy lightens the dish while the roasted aubergine adds real depth of flavour. 1. Preheat the oven to 180˚C, gas mark 4. Start with the paste. Grind the coriander and cumin seeds to a fine powder in a spice grinder or pestle and mortar. Transfer to a blender with the remaining paste ingredients and blitz until smooth. You may need to add 3-4 tbsp water and scrape down the sides occasionally. 2. Prepare the aubergines. Cut each one lengthways into 10-12 wedges and make deep incisions in the flesh of each wedge at 1-2cm intervals. Put on a baking tray and drizzle with 3 tbsp oil. Roast for 25-30 minutes, until soft but still holding their shape. Don’t worry if the edges burn slightly. 3. Put the remaining 3 tbsp oil in a pan set over a low heat. Add the paste, basil, lime leaves and sugar; fry for 2-3 minutes. Increase the heat to high; stir in the coconut milk, beans, salad onions and soy. Turn the heat down to low, add the coconut cream and simmer until cooked, about 3-5 minutes. 4. Put the roasted aubergine in a serving dish and pour over the curry sauce. Garnish with the red chilli and basil leaves just before serving.